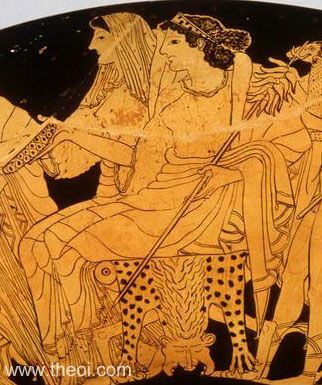 Detail of Hestia and Demeter from a painting depicting the reception of Heracles on Olympus. The pair are seated on stools draped with leopard skins. Demeter holds a staff tipped with sheafs of grain and the maiden goddess Hestia is modestly attired with a veil.